Sometimes you meet someone on a golf trip you wish lived a lot closer. Derek Gutierrez, Director of Golf/General Manager at Santa Ana Golf Club may have to get an Editor's Choice Award for Friendliest D.O.G. Derek should be affable as the sister courses he manages, Santa Ana GC and the adjacent Twin Warriors are remarkable for varying reasons. "Having two championship golf courses within a mile of each other is a blessing, for sure," explained Gutierrez. "Located on the pristine Santa Ana Pueblo, Santa Ana Golf Club and Twin Warriors offer two completely different tests of golf. Santa Ana is shorter in length and has few forced carries. Rolling hills bordering most fairways make it a bit easier but undulating and speedy greens at Santa Ana make it a challenging test. Twin Warriors is significantly longer than Santa Ana and offers forced carries on many of the holes. The greens are not quite as undulating and can sneak up on you with subtle and hard to read breaks. Common and consistent feedback includes how well our courses are cared for and the exceptional playing surfaces we extend day in and day out," concluded Gutierrez. My morning round consisted of nine holes on their Tamaya and Cheena nines, a classic combo highlighted by gorgeous water features and the finest conditioned greens on the trip. Six sets of tees make Santa Ana's 27-hole layout a joy to play, and you'll never be bored thanks to amazing views of the nearby Sandia Mountains. After an excellent lunch it was off to their Star Nine, which was my personal favorite, thanks to a strong collection of par-3s and 5s. Derek hit the nail on the head, Santa Ana will not intimidate the higher-handicap player, instead the design allows off-line shots to be found and hopefully recovered for par or bogey. Again, I cannot say this enough - is it such a joy to throw your clubs in the car after playing 27, drive three minutes and play a new 18 before dark. 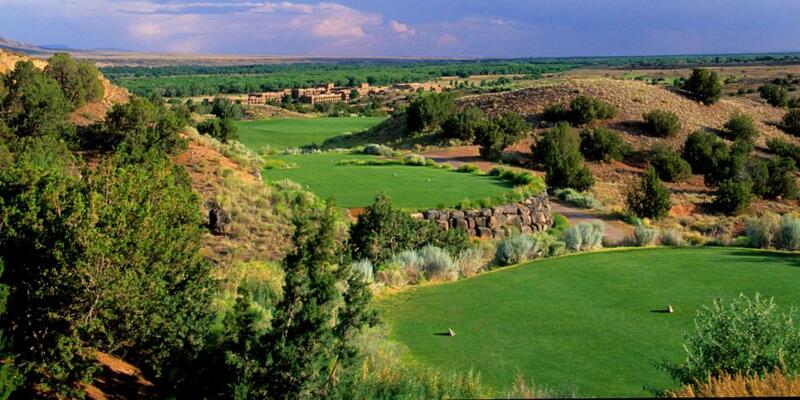 Twin Warriors Golf Club is Wolf Creek lite to me, with dramatic views and elevation changes throughout. This is desert golf carved through the mountains at its finest with too many signature holes to even mention. For me, the round really starts during the five-hole stretch beginning at the par-3 4th. A picturesque waterfall flanks the putting surface and gives this hole exponential character. The 392-yard par-4 5th is tucked in a valley and features a flat green that is begging to be one-putted! Honestly you'd be hard pressed to find a hole that doesn't fit your eye - Twin Warriors in my mind is the most underrated property on the trail! For more information on their affordable stay and play packages and up-to-date golf rates, visit https://mynewmexicogolf.com/twin/.